I’ve noticed that E has become more fidgety after school lately, needing to burn off extra energy. 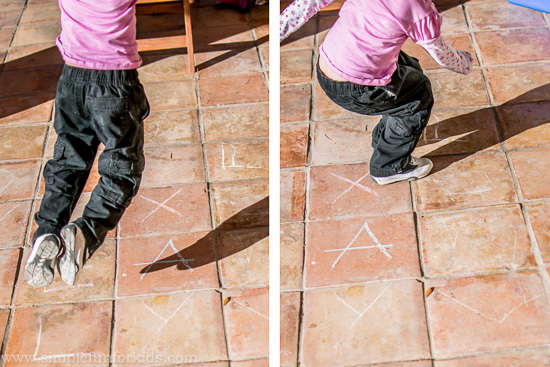 One day, I got out some chalk and decided to play a little gross motor alphabet hop game with her. 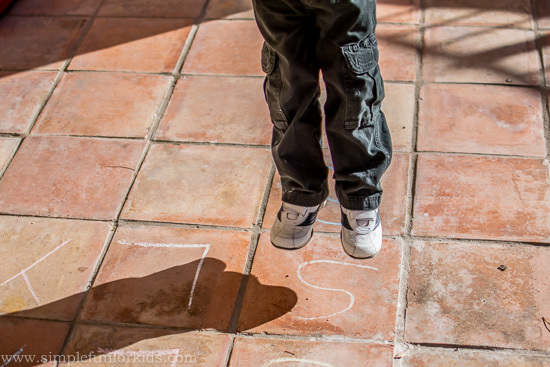 This movement game is extremely simple to set up and very flexible. You could use it with numbers, sight words or colors. 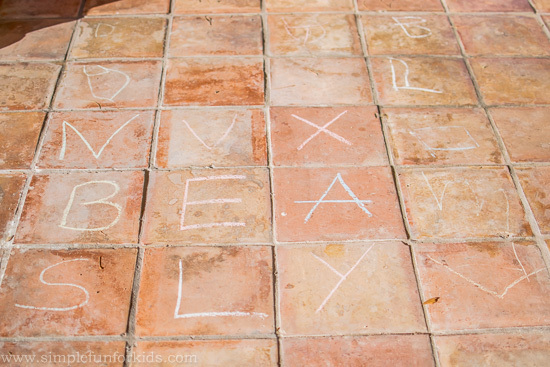 I used the tiles on our patio as a grid, but it’s not necessary. You can play this game wherever you have a little room to jump around. If you’d like to play inside, you could use painters tape to write the letters. 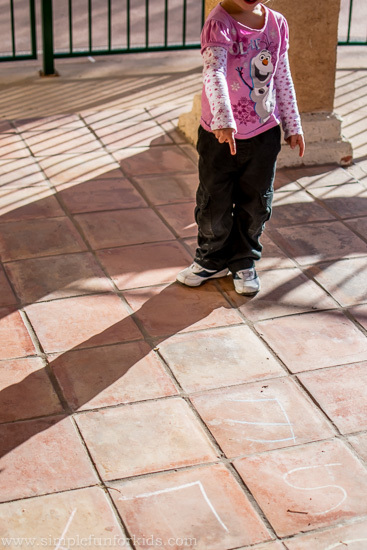 As soon as I started writing letters on the tiles, E came over. I thought we might be able to spell out something, but she wanted to write her own letters. I just went with it, and we used random letters. I started calling out letters for E to jump to. 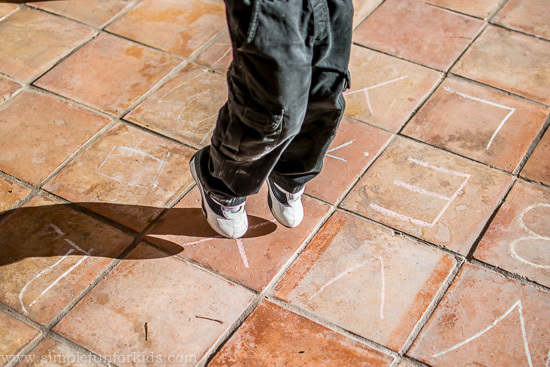 With all that jumping, some of the letters started getting a little smudged. She decided to trace them for better readability. I wasn’t entirely sure about E’s jumping abilities when we started, but when I saw how well she did, I called out more challenging jumps as we went. Check out this one clear across the grid! Next time, we’ll try jumping on one leg! While we played, E added a few more letters, and some scribbles. I thought it was supposed to be an eight, but when I asked her, she said it was a snowman. Of course, I made sure to have her jump to the snowman several times. 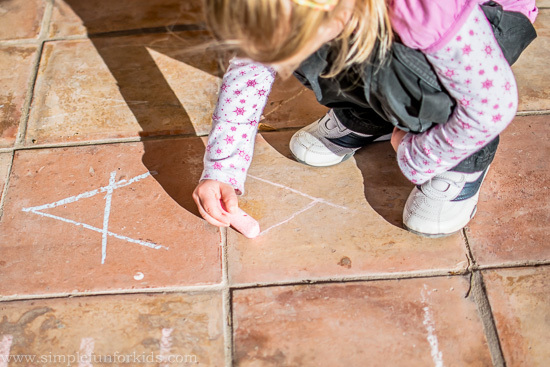 For another gross motor learning game that you can customize to your child’s skill level, check out this Gross Motor Color Game! 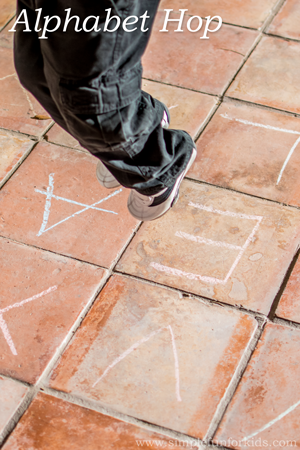 Have you played an alphabet hop game before? What would you use this idea for? Leave a comment below, I’d love to hear from you! If you like this post, click here to subscribe to my newsletter and receive an email once a week when new posts are published, or to my RSS feed. Also make sure to follow me on Pinterest to stay up to date with all we do, and for lots of great ideas from others! If you prefer Facebook, I’d love to connect with you there: Like and drop me a line on my Facebook page, where I share my own posts and those of others every day! 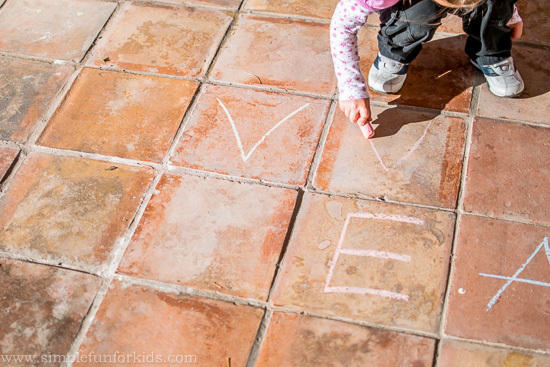 So easy and fun for learning the alphabet! 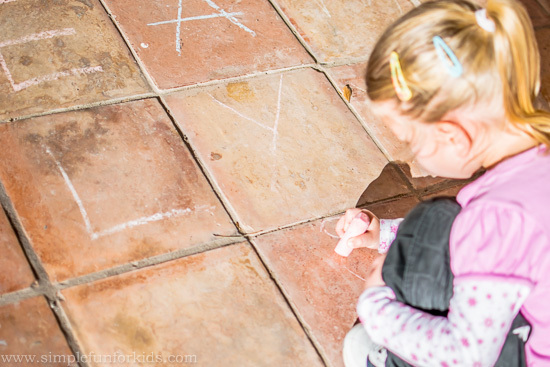 Thanks for linking up with Family Fun Friday! Thank you for the kind words, Selena – and thank you for the feature!